The Hollenbeck's Spring Classic has been sponsored by the Finger Lakes Cycling Club since the early '80s. It is usually scheduled for the first Sunday in May. 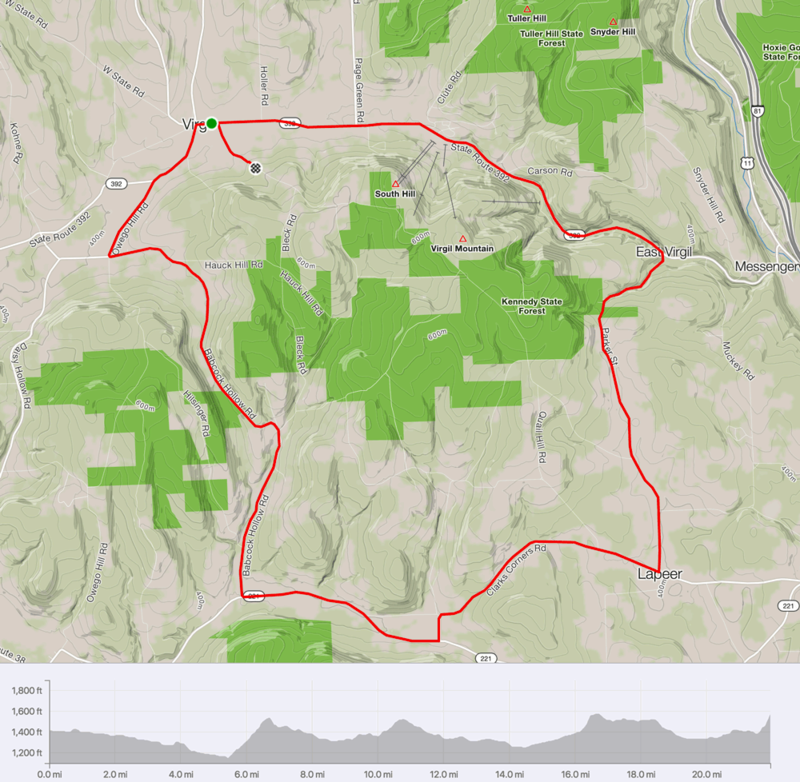 The route is a classic road course on mostly small roads in the vicinity of Virgil, NY, circling the Kennedy State Forest. The laps are 22 miles, including two major climbs per lap, and a finishing spur up a short, steep climb that will separate the real contenders from those who have been just hanging on. All categories are on the course at the same time, (staggered starts) with different categories doing different numbers of laps. At this time of year the weather can be anything from beastly hot to snow flurries. (We've had it all!) In case of questionable weather, the rule is that we race even if the sun shines! As with other FLCC events, entry fees are primarily used to provide food and drink for racers, volunteers, and spectators. The course is a 22-mile loop with two major climbs and a total of 1,200 feet of climbing. A 25-tooth is recommended. The race starts at Hollenbeck's Cider Mill, Route 392, Virgil, NY, 3 miles west of Greek Peak Ski Resort, approximately 5 miles southwest of Cortland and 15 miles east of Ithaca. The course finishes at Van Donsel Road across from Cider Mill. Day-of-race registration from 8:00 to 9:30. $35.00 for pre-registration; $45.00 for day-of-race registration. $10.00 for juniors. Rollout required for all juniors. Free entry for reigning NYS Road Race Champions in each category who wear their champion's jersey. ANSI approved helmet required for all racers. Race promoter reserves the right to combine fields or change distance, depending on weather and field size. Pint glasses for top 7 in each category. Hollenbeck's donuts and Gimme! coffee for all riders and volunteers.